"From Day 1, we knew we were the best club; it's just a matter of going out and playing," said Dodgers manager Dave Roberts. "The Rockies and Diamondbacks were playing good when they came in here, and we wanted to play well and we took care of business. Now we have to continue to do it. But we've shown after big series, we don't let down; we keep going. That's a credit to the guys in the clubhouse." This Day in Dodgers History: In 1978 the Dodgers traded two players to be named later to the Astros for catcher Joe Ferguson. The two players eventually sent to Houston were Rafael Landestoy and Jeffrey Leonard - both of whom had long MLB careers. In 1994 the Dodgers signed amateur free agent Adrian Beltre out of Santo Domingo, Dominican Republic. As you may recall, this became a very controversial signing as it was later determined that he was only 15-years old at the time - you must be at least 16-years old to sign with a team. As a result, the Dodgers were fined $50,000, and scout Pablo Peguero and the Dodgers' head of Dominican operations Ralph Avila served one-year suspensions. Go here for further background. In 1998 reliever Jeff Shaw becomes the first player to have ever participated in an All-Star Game representing a team he had not yet played for. Just three days prior he was traded by the Reds to the Dodgers for Paul Konerko and Dennys Reyes. BTW, today is also Jeff Shaw's birthday. Happy Birthday, Billy Herman, Johnny Van Cuyk, Glenn Hoffman, Jeff Shaw, Mike Busch & Brandon McCarthy! Per Harold Uhlman at Think Blue LA; "Meet Peter Summerville – Quakes ‘Performance Science Coach’"
Per Jeff Sullivan at FanGraphs; "Here’s an Astonishing Clayton Kershaw Statistic." When Kershaw has thrown a pitch while behind this season, hitters have swung more than 64% of the time. That’s the highest rate in the game, by nearly eight percentage points.... As another way of understanding this, Kershaw’s swing rate here is higher than the average by very nearly four standard deviations. Anything that’s so far from the average is a statistical absurdity. It took work to get to this, but that doesn’t make it any less insane. Hitters have lost their minds trying to make Kershaw pay when they’ve had the chance. It’s not that it’s the wrong idea. It’s that it’s the idea at all. Hitters know that, when Kershaw gets into a decent count, they don’t have much of a chance. And so, far more than ever, Kershaw’s opponents have looked to pounce when they’ve known he’ll be around the zone, throwing one of two pitch types. We did it! He's an All-Star. Per Joshua Thornton at MLB.com; "Turner humbled by Final Vote victory: Dodgers third baseman headed to first All-Star Game." "It's incredible," Turner said about the votes he received. 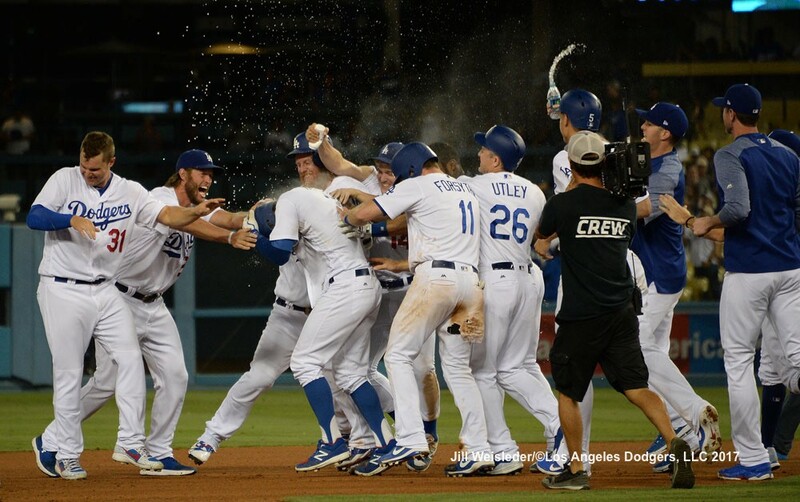 "I think what it did, it set a bar for the Los Angeles Dodgers and for All-Star Games for years to come. I think Kenley [Jansen] caught a little bit of heat for what he said in San Diego, but he also sparked a huge mob of voters to get out there and prove that Dodger fans are the best fans in baseball." Justin Turner received 20.8 million votes -- setting a Final Vote record. Per Eric Stephen at True Blue LA; "Yusniel Diaz wins California League Player of the Month for June." The autograph scandal brewing at Panini is not getting better. Corky at Pack War writes; "Two More Additions To The Panini Autopen Scandal." No... I'm not crying... There's just something in my eye. Per Blowout Buzz; "Custom Topps card helps collector receive life-changing news." Congrats, Alex Wood! You're an All-Star!